The hotel room is taking a bit of getting used to. It is a large room with wood parquet tiles that squeak every time we walk over it. By the time I had sorted the shower out my leather mocasins had started to float out of the bathroom, they eventually took on water and sank. Today was a Mary-organized museum day. To get started we had to validate our three-day transit passes so we got on a tram, validated our tickets in the machine, and got off at the next stop which happened to be at the museum of modern art. It is a very interesting building but practically all of it was closed while they put on a new exhibit. The only open part was an exhibition of Austrian photography which was either pictures taken of a demonstration in London or an ancient video, made in English, about a stone age tribe in the Philippines which had only recently been discovered. These poor buggers were living from hand to mouth yet they seemed pleased that they had been introduced to money. Man-made island in the river. Not many people around on a Sunday morning. Our next adventure was at the Armoury. This is a vast, four floor, store of armor and weapons that was built so that the army could quickly be armed to repel invasions from the Turks. The main point about this place is the sheer numbers of each item - there were several hundred swords, pistols etc. It never ceases to amaze us how much effort man has put through the ages to devise ways of killing and maiming other people. We had a quick look into the Landhaus. It was very quiet compared with yesterday when people of a charity event tried toget us to fork out money for something of which we had no knowledge. 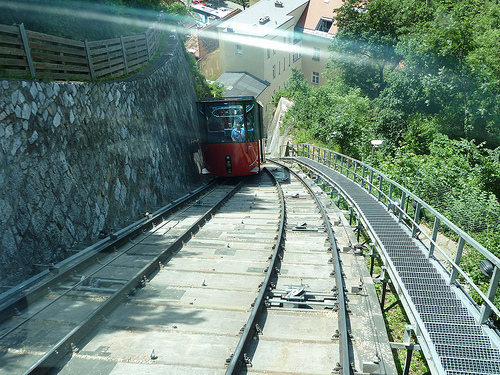 A quick tram ride brought us to the base station of the funicular railway for the ride up the Schlossbergbahn. We felt cheated because all rides on the funicular today are free. We were a little puzzled what we would find at the top - the car coming down contained a number of men in period military costumes and carrying weapons. They were followed by a military brass band including a fellow at the back who was wearing a big drum. At the top the smell of sizzling pork sausages filled the air and the noise of bawling kids was loud until noon when the big bell in the Glockenturm was wrung 101 times -boring. Lots of kids had painted faces and sported a balloon secured to their wrists. We went back down after having spent all of 15 minutes there. The reason there were few people around the town was that most were up the Schlossberg while the rest were piling out of the churches as we walked back into the centre of town. At least these are real people as there are very few tourists here. A #7 tram and a short walk took us to the Schloss Eggenberg, another great palace but this one in a very pleasant deer park. We didn't see any deer but the place was pretty well overrun with peacocks. In good weather the grounds, with their flower displays, were very good. The peacocks make a lot of noise and we wondered if they annoyed the people living around. There was a pleasant pool with irises and weeds (but no ducks) as well as a formal pond with water lillies in flower and many koi of various sizes. The numerous Peacocks wanted food and would come close in the hope of getting some. The final museum was in the Herberstein Palace. The first exhibit was two chairs in a room with piles of numbered tickets that had been thrown on the floor. There was a video showing two men sitting on the chairs tearing off the tickets and throwing them on the floor. The value of this deeply significant act evaded me but I dutifully followed the red carpet right through the exhibition and back to the front door. 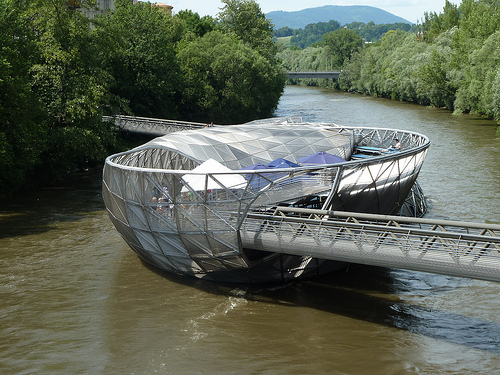 The man-made island in the river is an interesting structure and we lingered some time there over a beer. On the way back to the hotel we were waiting for an oompah band to start playing but the garrulous man with the microphone (and a big drum) pointed out that a priest was throwing holy water all over a woman in an invalid car so we left. On the main bridge across the River Mur we stopped to watch the surfboarders who find their wave and ride it hanging on to a rope suspended from the bridge. They are watched by people on the side in a fake beach with sand, deck chairs etc. 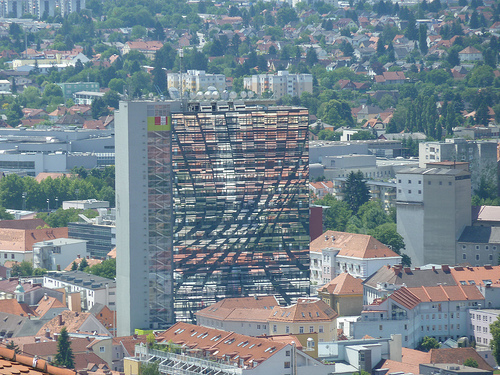 My birthday dinner was in the hotel because not many restaurants are open in Graz on Sundays. We started with an amuse gueule which consisted of a large slab of chicken liver pate each with an edible flower. The rolls were exceptional and we had Styrian pumpkinseed oil to dip as well as salt and butter. For a starter Mary had smoked arctic char with an asparagus morel custard while I had calf's head cheese and calf tongue with pesto sauce. For main course Mary had stuffed chicken breast with fried gnocchi while I had three types of veal - roast, schnitzel and goulash with mashed potatoes in a pasta case. We decided to have dessert. Mary had rhubarb with baked custard and a strawberry pepper sorbet. I had Apple Marscapone with a Calvados Foam. The restaurant was practically empty apart from a man with a beret who was sketching the waiter. He was evidently well known in the restaurant. At one point a woman walked up to him, they had an argument and she left. He was colouring his sketch with water colours as we were leaving. After that we walked our meal down, a little, by walking around the old historic part of the town.